This was a skincare brand I had never even heard of so I was very keen to try out these products. 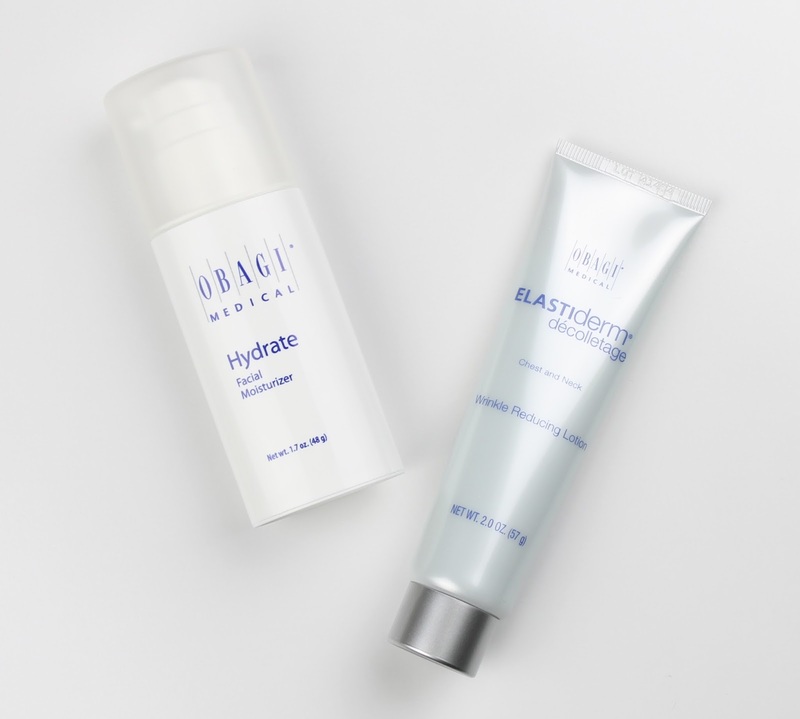 Obagi is brand based in pharmaceutical research and dermatological science and is usually stocked and recommended by dermatologists, spas and other skincare professionals. As you probably know by now, I struggle with dehydrated skin so the moisturiser was a clear winner for me. At 23 I obviously don't have to worry about to many wrinkles on my decolletage but prevention is key so there is really no age limit. This moisturiser is purposely formulated to provide lasting hydration and moisture protection throughout the day. It provides immediate moisturisation but holds that moisture for up to eight hours. I actually really liked the consistency and feel of this one. It is a little thicker than I usually prefer in my day creams but it absorbs very quickly and leaves my skin very soft. It also works very well under makeup because of this quick absorption. I definitely noticed a significant increase in my skin's hydration while using this one and I also really like that it is simple with no fragrances which means it didn't wig out my sensitive skin at all. For some reason I have been having pretty consistent reactions to all but a few day creams over the last year so it is great to find one that works well with my skin. So obviously this is a high end anti-aging product so it isn't something I would usually buy. At 23 I'm concerned more with keeping my skin hydrated and protected from the sun. That said though, I did really like this product. It was intensely moisturised and visibility approved the appearance of my decolletage area. I can't speak to it's wrinkle reducing claims because I don't have any, but it definitely helped improved the appearance of the skin by re-hydrating it. Those of you with more mature skin who are looking to improve the elasticity this might be worth a try because the decolletage is often neglected but sees just as much sun damage and damage by the elements. I really liked trying out these products and I could even see myself repurchasing the facial moisturiser because it is a generous sized bottle and reasonably priced for such a high quality, dermatologist recommended brand. Have you ever tried anything from Obagi? I'd love to hear your thoughts in the comment below. 2 comments on "Obagi Skincare"
Obagi Skincare are the best products for the skin. These products would be best but this blog is established for https://www.rush-my-essay.com/ which is a different point. So i am reading this blog.